The GoldWing Clube de Portugal invited us to join them for the weekend. 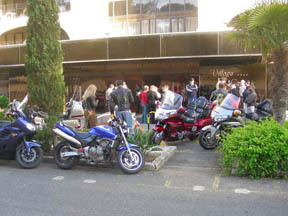 Before we left for the Azores the GoldWing Clube de Portugal had invited us to join them for their weekend gathering. They gather several times a year in an upscale location to talk and celebrate and ride. This gathering was to celebrate and memorialize the life of their president, Casimiro, who was killed in an auto accident on Feb. 25th. 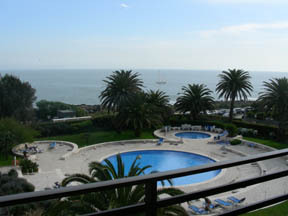 They chose a hotel in the resort town of Cascais, about 30 km. west of Lisbon and overlooking the Atlantic Ocean. We returned from the Azores on Friday and were met at the airport by Nuno, the fine gentleman who had arranged storage for our bike while we were away. He took us to our bike and went to get his while we sorted out gear for the weekend. Then it was off thru Lisbon and along the coast to Cascais and the hotel. The club had arranged a special rate for their members for Saturday night and the hotel extended it to us for Friday and Sunday nights too. That evening we wandered the nearby old part of the town with its narrow lanes which now were almost entirely restaurants serving food from all over the world. 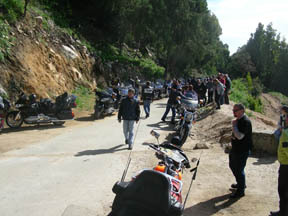 On Saturday the club members started to arrive for the weekend. They came from all over the country. But unlike the U.S., this means only a 1-day ride for even the farthest members. During the afternoon they held a business meeting to confirm the election of their new president, Carlos, who was Casimiro's brother-in-law. The Christian Motorcycle Association was invited for the weekend too and they also arrived during the day. For the fine dinner that night there were well over 100 motorcyclists to celebrate the life of Casimiro. There were many stories and memories of his life. He was very well loved and appreciated by everyone. On Saturday there was a ride planned to Cabo da Roca, the westernmost point of Europe via the narrow, windy roads of a forested park. There were approximately 60 bikes on the ride, with the GoldWings of the club and the others of the CMA. We stopped at a lookout point in the park and took pictures of each other and the view. 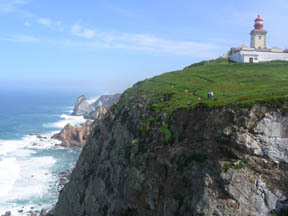 Then it was on to Cabo da Roca. As it was a beautiful spring day, and a Sunday, the parking lot at the point was packed with motorcycles of all sizes, descriptions and qualities. We walked around the monument on the point and looked over the cliff to the ocean several hundred feet below the lighthouse. Nuno bought us a certificate, with wax and ribbon seal, that certified that we had made it to the "Westernmost Point of Europe". The site is spectacular and very popular. It is only about 40 km. (25 mi.) from Lisbon by the most direct route, but has many more interesting roads to ride to get there. The day was sunny with light fluffy clouds scattered around and temperatures in the mid 60's F. Visibility was unlimited and we felt as if we could almost see the U.S. from the cliff top. After the break at Cabo da Roca we rode south along the coast to a restaurant that was right on the edge of the water. Here the coast is rock, not sand and the dining room was open sided, built on the rock and in a storm the waves would have crashed right into it. (They had big windows that would have closed it off during bad weather.) Here we had a great 4-course lunch served in grand style. Carlos, the new president talked some more about Casimiro and had a memorial card for us all to sign. Lunch took several hours and we were all stuffed full at the end, but it was sooooo gooooooood. When it was over everyone returned to their homes and we returned to the hotel for one more night. We couldn't stay anywhere else cheaper, the view was fantastic, and a great breakfast was included. The view from our room looked southwest out over the Atlantic Ocean and the entrance to the river that led east to Lisbon. There were many pleasure boats about as well as commercial shipping. We have to return home on Tuesday for a personal semi-emergency, but we have one day left before we do that. On Monday we checked out of the hotel, loaded the bike and headed north thru the hills to the town of Sintra. 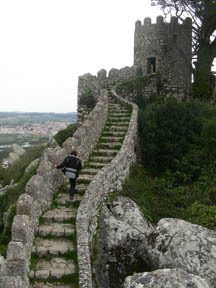 There is a Moorish castle from the 9th century and a fantastic palace, both situated on adjacent hilltops. We, with a couple wrong turns, found our way up a narrow windy cobblestone road to the ticket booth. The palace is closed on Monday (as are many tourist sites in Portugal) but the castle is open. It is in ruins with just some walls and turrets remaining, but is still very interesting. The walls run along the contours and giant rocks of the hilltop and would have been very difficult to attack. There were cisterns for water but no wells, so the way to conquer it would have been a siege and hope for a dry summer. After the tour of the castle we headed on north towards the seaside town of Ericeira. Not for any special reason, just to take the long route back to Lisbon. I set the GPS to avoid freeways and major roads and let it lead us on small roads through many small towns and villages for the rest of the day. It was another beautiful day and we enjoyed it immensely. When we reached Lisbon we went to meet Nuno and set the bike up for storage in a place he arranged for us. Then he took us to our hotel and then the airport the next day. Nuno is a very special guy who gives without thought of return. All of the GoldWing Clube de Portugal and the CMA members were very nice to us, but Nuno stands out as very special. We are now at home, temporarily and the next update will be after we return to Europe. On to Planning Part C.